Rev. Calvin O. Butts at the official launch event for United to End Homelessness on April 9. Photo courtesy of Thomas Donley Photography. I’ve spent much of the last two months working to promote a new homelessness campaign in New York City. Regular readers of Print the Legend may notice that I don’t post much about work matters on this blog. I’m making an exception for United to End Homelessness, a grassroots project to shed light on New York City’s homelessness crisis during the 2013 mayoral election. 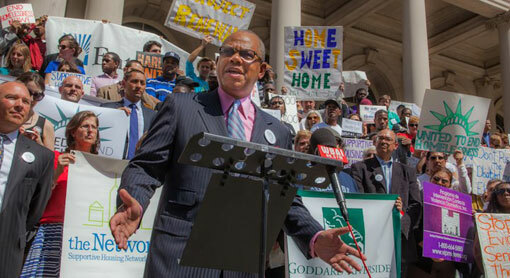 The campaign held its formal launch earlier this month on the steps of New York City Hall. To contribute to this brand-new coalition, I produced the website endhomelessnessnyc.org and the promo video below. I also wrote a piece about my involvement with the campaign, which ran in the New York Writers Coalition’s Narrator blog and PolicyMic. Follow those links and watch the video to learn more. The following is an excerpt from my review of Upstream Color, the glorious new film from Shane Carruth. You can read the entire piece over at Next Projection. Upstream Color is a kaleidoscopic cocktail of sound and vision. It’s a film that demands to be seen, not read about. So why am I writing this, and why are you reading it? I write to mobilize you out of your seat and into the theater, of course. But I also write for the sheer challenge of capturing the hallucinatory qualities of such a slippery picture. This is a dizzying experience, aesthetically and emotionally, with few points of reference to ground your viewing. It leaves you lightheaded and with a heavy heart. For 96 unrelenting minutes, Upstream Color has you mystified yet feeling like nirvana lies somewhere just over the horizon. To start, has the world ever seen a polished, feature-length film that feels more like the work of a single human being? It’d be inaccurate to refer to Upstream Color as Shane Carruth’s “baby,” because even babies require a second person somewhere along the line. Upstream Color, on the other hand, features Carruth as director, writer, cinematographer, editor, composer, producer, co-star, and distributor. Even Terrence Malick – a clear influence here – relies on musical titans like Camille Saint-Saëns and Francois Couperin to achieve the transcendent heights of films like Days of Heaven and The Tree of Life. Carruth’s film, meanwhile, plays like the unfiltered sum of one man’s fears, hopes, and creative impulses.